Adventures in the Endless Pursuit of Entertainment: Oh Madame! Stephen Sondheim's A Little Night Music originally opened at the Shubert on February 25, 1973. It moved to the Majestic during the run and closed after 601 performances. It's the most romantic of Sondheim's works. Produced and directed by Hal Prince, with a book by Hugh Wheeler, it won Tony Awards for Best Musical, Best Book of a Musical, Best Original Score, Best Actress in a Musical for Glynis Johns, Best Featured Actress in a Musical for Patricia Elliott, and Best Costume Design Florence Klotz. Finally a Broadway revival of A Little Night Music is on it's way to Broadway. Set for an opening sometime in December, this production is an import of Trevor Nunn's West End revival stil playing in London. Our Steve on Broadway caught the show in December, 2008 and gave it the coveted four out of four stars in his review. I have seen three productions of A Little Night Music - and I had to travel to Maryland, Connecticut and Massachusetts to see them. Now, it's my most anticipated production of the upcoming season - perhaps of the remaining decade - right here in New York! I have dreamed of casting for the leading lady, Desiree, originally played by Glynis Johns - Christine Ebersole, Victoria Clark, Barbara Walsh, Bernadette Peters, Donna Murphy - but I'm most excited for the buzz surrounding the casting of Madame Armdfeldt, Desiree's mother. In the April 29, 2007 interview with the Times, Angela said, "[I]t had been asked if I would consider playing Madame Armfeldt in ‘A Little Night Music’ — well, yes, I would. That would be an interesting kind of character, doesn’t have to hold the whole show." For weeks, the chatterati have been buzzing about Angela Lansbury going in for meetings about playing Madame Armfeldt. Earlier this week, Broadway.com even posted the burning question, Will Angela Lansbury Have a Liaison with Night Music on Broadway? Last night, I received a text from Kevin, the Theatre Aficianado at Large that "ATC poster claims Angie signed NIght Music contract two weeks ago." Say it's so! Perhaps all of those candles I've been lighting will pay off, and we'll find out that Angela will go from her Tony winning turn as Madame Arcati to Madame Armfeldt! Maybe we can get a Lithuanian bishop to say Mass. Wow, that is an awesome shrine. OMG. You have the MAME ornament. RivB, was there any doubt that I wouldn't have the MAME ornament? I had planned to get two and wear them as earrings ;) but they are almost as big as my head so that's really sort of impractical, don't you think? 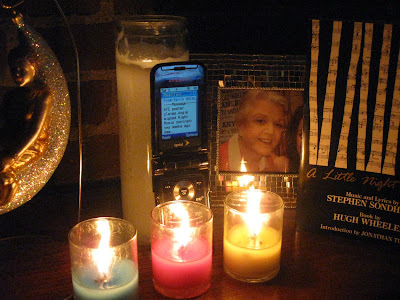 Hahaa Oh Sarahb, you're my fav - look at that shrine! You would have looked a sight with MAME ornaments as earrings, but I would have highly approved of such goings on! I love it! Sarah, your shrine is beautiful! And that picture of you with Angela is precious. Treasure it!